This fall I entered the Quilt for Change quilt challenge called "Water is Life: Clean Water and its Impact on the Lives of Women and Girls around the World." I designed a quilt and submitted it for consideration and it was accepted to be part of the exhibit at the United Nations in Geneva. My quilt is titled "When the Tap is Finally Turned On." "When the Tap is Finally Turned On" designed, pieced and quilted by Anita LaHay. Women and children dancing and rejoicing when they are finally freed from having to search for and haul water. Giant tap pouring out a rainbow of hope with clean water for all. The opening for the exhibit has been set for March 22nd. I wish I could attend! My quilt has been entrusted to Canada Post and is on it's way to the US Embassy in Italy as I type. It will also hang at the US Embassy in Rome in October. This quilt will be much more well travelled than I am. "Water is a precious commodity." That is what my mother always used to say to us when we were kids in the 70's and 80's. This statement is true now more than ever. I have never had to haul water every day to survive but I often think of those who do. Recently the safety of water in our town was compromised and we were under a boil water order. This really made me think about how much we need water and how difficult it is for those who don't have access to clean water. When thinking about the theme of the quilt challenge I kept wishing that I could think of a solution for the women and children who do not have clean water and must work so hard to get what water they can. I know it will take the work of many powerful people and governments all over the world to create a lasting and viable solution. 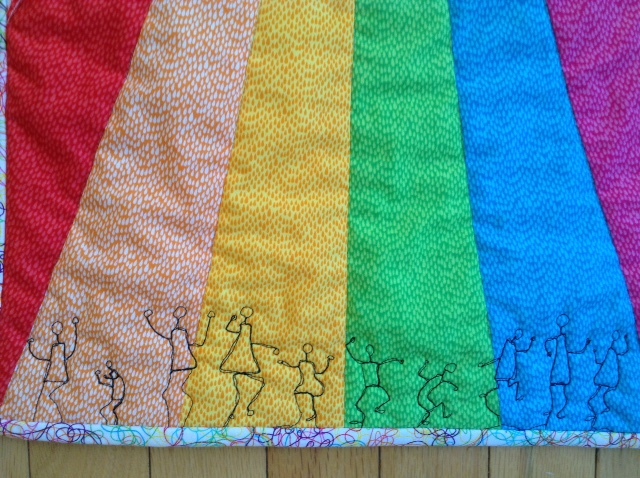 My quilt conveys what I imaging it would be like for the women and children when the tap is finally turned on. A beautiful rainbow of hope with the women and children dancing and celebrating their freedom from the labour of finding and carrying water.